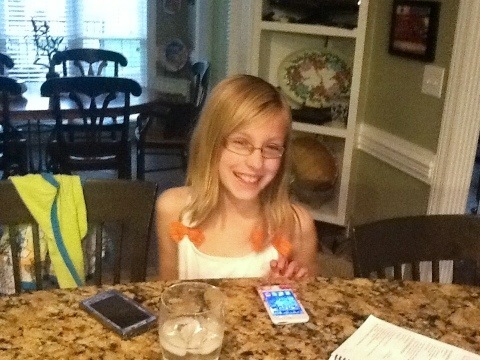 4/8/2012 edit: Happy Easter! 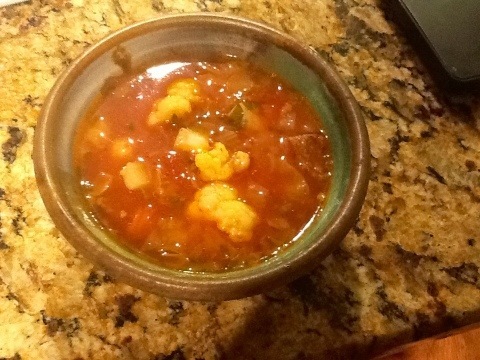 Please come visit my recipe on Easy Natural Food’s Sunday Soup Night! This trip home has been a walk down memory lane. 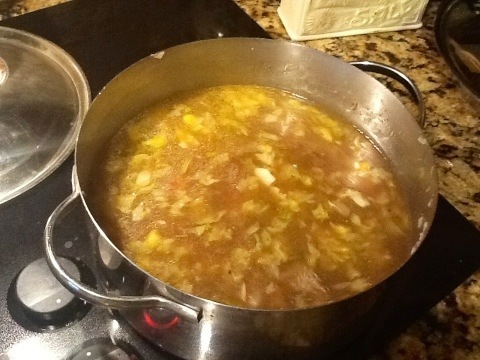 I had requests for Hamburger Soup and Raspberry Bavarian Pie [stay tuned for a Paleo version in an upcoming post], two recipes that were a staple of our family. 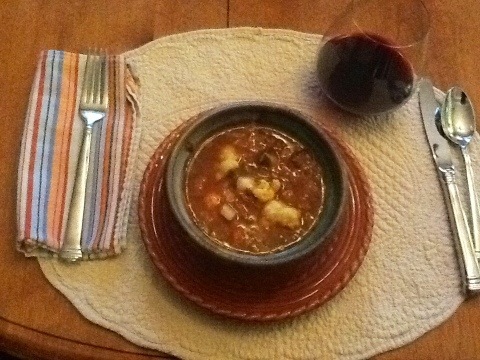 Hamburger soup brings back memories of my childhood. 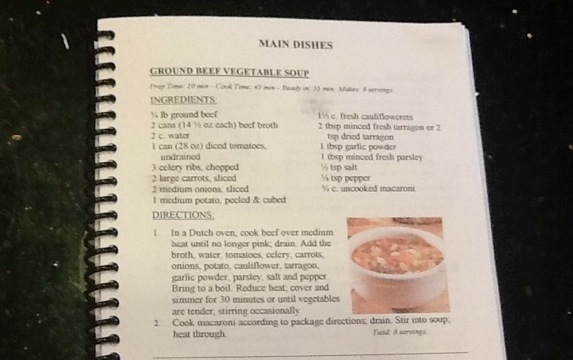 My mother (Jennifer’s grandmother) was known for her hamburger soup. As I recall, we started having it quite often about the time that Dad had back surgery and was on disability. With the big vegetable garden in the back yard and my dad’s love of all vegetables in season, the recipe would vary with the seasons. I sometimes called it stone soup, since it could be stretched to feed our large family and any relatives or friends who showed up. Of course, we had homemade egg noodles or egg dumplings in the soup (not too paleo). 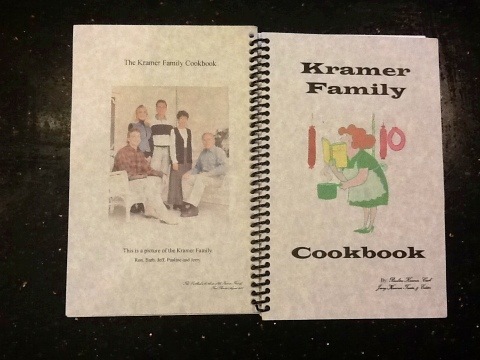 In looking for a recipe as a guideline, since I seldom use recipes, I looked in Iowa church cookbooks and then remembered my Christmas present from my brother and sister in law, Jerry and Pauline Kramer. And, there I found my guideline for today’s version of Hamburger Soup. We made some variations based on family and diet concerns. 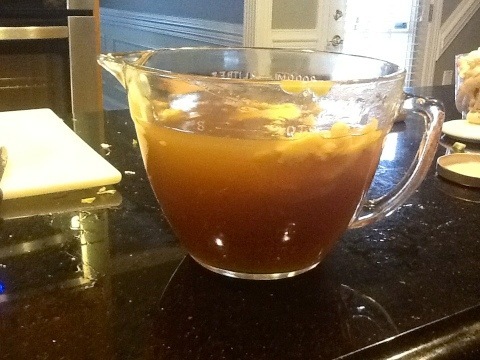 Starting with Jen’s beautiful home made beef consommé instead of my usual canned or packaged beef broth, the result was wonderful, flavorful and hearty. 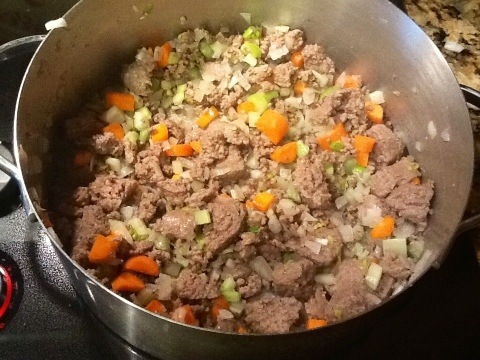 Brown the ground beef in a large stock pot. 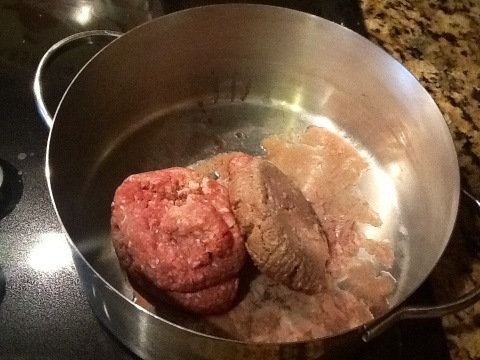 You want to have some chunks of meat, so don’t break it up completely. 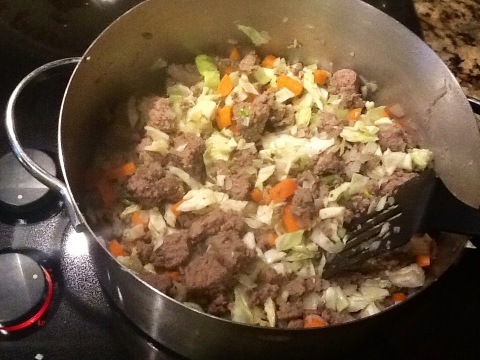 Add celery and carrots and continue to sauté. Secretly add cabbage when no one is looking. Jen’s paternal grandmother didn’t tell her kids that their favorite soup contained cabbage until they were adults. As a child I loved to help out in the kitchen and be first to grab the heart of the cabbage. What a nice crunchy treat, doubt that I knew it was also healthy for me. I still love the cabbage cores. Also add the two cloves garlic. 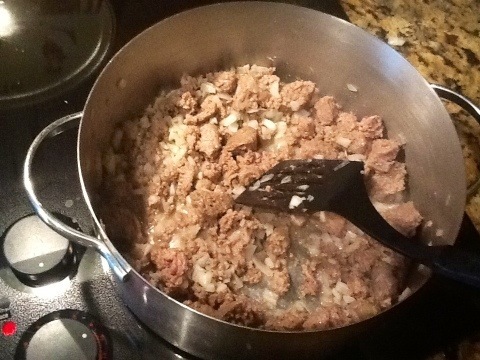 Add salt, pepper and granulated garlic. Jen writes: Add the tomatoes. 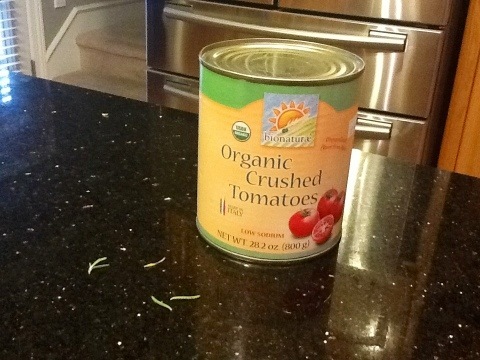 I like this brand of tomatoes because the can is BPA-free. Cook for about an hour, then add the cauliflower. I remember calling this “dumpling soup” when I was a kid. I don’t really care for dumplings anymore, but I thought that the cauliflower florets would be a healthy substitution. 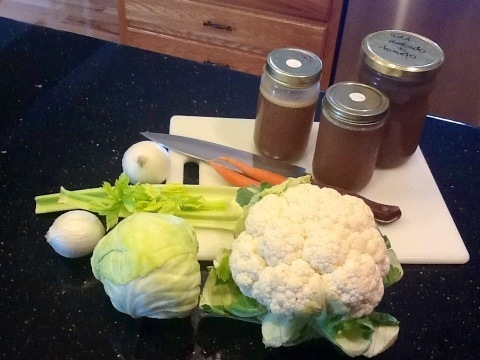 We didn’t have cauliflower in our soup growing up. Add the fresh herbs and adjust seasoning to taste. We needed extra salt because my homemade stock was unsalted. It helps to have someone else do the tasting. Mom would often have me taste a soup or sauce that she was cooking to make suggestions on the seasoning. Cook for another 30 minutes or so. You could also make this recipe in a crockpot and cook it all day on low. Optional: cook pasta separately for family members not following a Paleo diet. 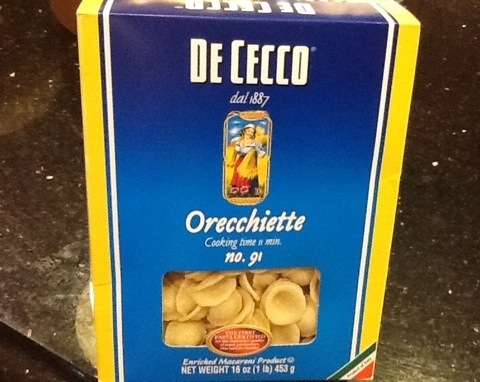 We had the girls guess what orecchiette meant. Dora was tickled to learn that it meant “little ear”. Jen writes: This is my place-setting. The non-Paleo eaters had the option of serving the soup over pasta. The soup was just as delicious as I had remembered it. Dora couldn’t believe we were torturing her like this, but Jewel ate the soup heartily. I knew she really liked it when I had leftovers last night because chewing made my head hurt. She said, “no fair – I want soup too!” So she had hamburger soup alongside her hamburger! this recipe. Just stop by my blog on Sunday – the link will be up! Thanks so much for the invite, Debbie! I look forward to stopping by!